As a brand, She Makes Cents is all about inspiring and informing you of ways to use your “cents” to live a fabulous life. So it’s time to start thinking about…well, some fabulosity. Now that the weather is warm and I have officially come out of hibernation, I keep thinking of ways I can get my entertaining groove back. Luckily the calendar is on my side as next week presents a few options for themed entertainment with the Kentucky Derby & Cinco de Mayo. While I LOVE the idea of playing dress up for a Kentucky Derby party, I am leaning toward a chic yet laid back Cinco de Mayo celebration. I plan on keeping the guest list intimate and executing a food and beverage plan that will keep costs down. Working in the special events industry certainly comes in handy with my planning. 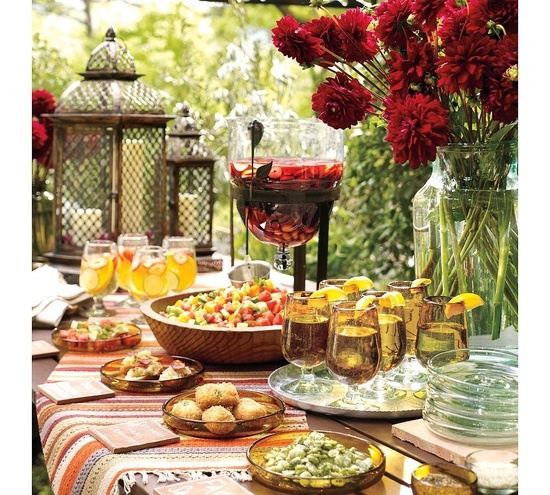 A fun taco bar, vibrant colored fruit, and of course, a signature drink will create a fun atmosphere for my guests! This is where presentation makes the difference between being the host of a cheesy get-together or hosting an event with effortless style! Check Out My Inspirations Below! 1. Keep your guest list small & intimate. I often find that I am able to be more apart of an event when there are fewer people. The conversation is more engaging and it lessens the chance of people cliqued up and not mingling with new people. 2. Go Green. Don’t waste your money on paper invitations or Evites. Instead, try calling people. It’s more personal, your guests will appreciate the effort, and you are more likely to get an immediate rsvp. 3. Be Like Santa! Make a list and check it twice. Save yourself money and stress by making sure you get everything you need ahead of time. Having to rush to the store to grab an extra bag of ice is never cool. 4. Select a Flexible Menu. My taco bar allow guests to essentially make their own meal. It’s cost-effective and this removes the chance of me forgetting that Lauren is allergic to cheese and Victoria hates onions just as much as I do. An added bonus for this particular meal is that all the colorful ingredients can be stylized to create an awesome visual display on the table. A signature drink or two (one with plenty of spirits and one without) helps keep your beverage budget down…especially compared to an open bar. 5. Added Touches. I never host an event without background music, fresh floral, and a co-host. Keeping your guests comfortable will keep your party going. Don’t forget the little things such as stocking up on extra TP and paper towels, strategically placing trash cans throughout the house, citronella candles for outside, and thoughtfully positioned seating areas for guests.